EB Morgan House overlooks Cayuga Lake. Standing in the main street of the village of Aurora, with historic mansions on one side and idyllic lakeshore on the other, I feel like I'm on a movie set. Only, I'm not sure which movie. Is it Anne of Green Gables? Or The Truman Show? Regardless, the reinvention of Aurora – a country town of some 800 permanent residents – is a story that could be told only in America. And like all stories, we must start at the beginning, which is where I check-in. Wallcourt Hall is a handsome three-storey edifice of red brick, pillared porch and Dutch-style gables. It looks like an old court house, but it was actually a prep school built in 1909. After $US8 million ($10.7 million) was spent remedying significant structural decay (the walls were eaten by ivy), it opened in May as a 17-bedroom hotel. 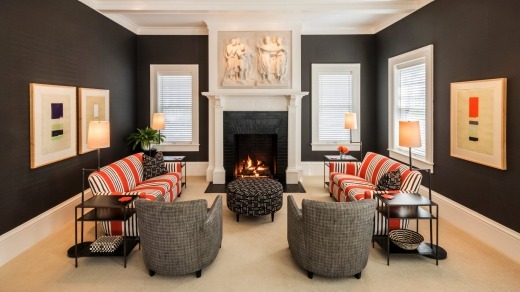 Inside, I discover a tall-ceilinged lounge room with grand open fireplace, only instead of American neoclassicism there are lavish orange sofas set against charcoal-painted walls. The fabrics are Italian and the contemporary art is most definitely original. It's redolent of the two things Americans seem to respect most: wealth and confidence. To my surprise, a night here costs the same as a night in a Sydney CBD motel – $US150, or about $200. Across the road are three more boutique hotels: Rowland House, EB Morgan House and Aurora Inn. They've been similarly restored to a state of perfection, each costing somewhere between $US5 million and $US10 million, however they're older mansions in the grand tradition, enjoying private lake shores as well as boathouse, boat wharf and neo-Grecian folly. 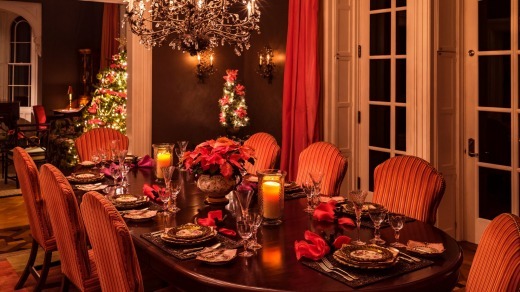 The interiors are extraordinary, a compelling mix of 19th-century American grandeur (wood panelling, sweeping mahogany staircases, etched glass) and Martha Stewart down home comforts. Antiques, artworks and contemporary lighting provide sophisticated guests from Manhattan, Philadelphia and Toronto with the requisite "wow". Rooms in these properties likewise cost about $200 a room (off-season) rising to about $270 in summer. You don't have to be a venture capitalist to figure that something isn't quite adding up. Aurora is in the green rolling farmlands of upstate New York, two hours' drive from Niagara Falls, four hours from New York City. To get here you pass through logging towns and farming towns where there's more decay than decadence, where roadside diners serve grits and bar-rooms serve homilies like "Ban idiots not guns". Indeed, Aurora stands quite alone in its manicured, old-money glory. Just like the four retreats – collectively called "the Inns of Aurora" – the line of artisan shops has been gussied and primped, including Bet The Farm artisan cheese and wine shop, Dorie's Bakery and the Arts & Design Centre. They're all just so. Ersatz. Like a movie set. To take the town's pulse, I enter the Fargo Bar on the Main Street. Its red bricks look freshly pumiced, and door-staff greet me like I'm entering a fine restaurant. Inside, it's all artisan beers and carefully chosen bar-a-phernalia. But here's the odd thing: at the counter, away from the tourists, I see a couple of old boys nursing their craft beers, peering from under grimy hats branded with John Deere and Winchester; in the tailored beer garden with its water feature, I see single mums eating burgers with their kids. If it's a movie set, they're working to the wrong script. The view from Rowland House. A few doors up from the bar is a private college called Wells. 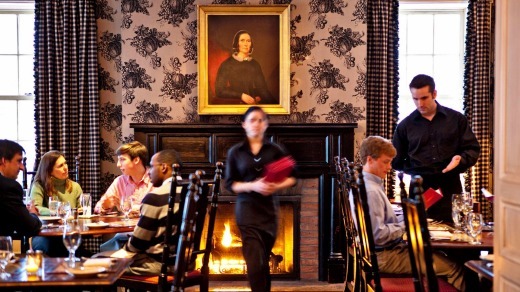 Founded in 1868 to educate women, it looks like a mini Ivy League and still caters to some 400 (now co-ed) students. It was established by Henry Wells, who made his fortunes founding two mail services – none other than American Express and Wells Fargo. Wells and his business partner EB Morgan made Aurora their home. The village was doing quite nicely thanks to a grist mill, but they injected money into the small community and they built mansions. And for this story at least, that's where their parts end. 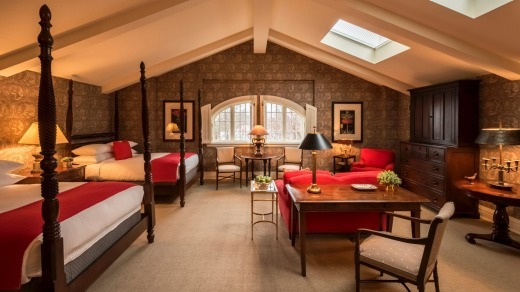 EB Morgan House is one of Aurora's boutique hotels. In 1962, a young woman called Pleasant Rowland graduated from Wells College and became a teacher in New Jersey. Concerned that young girls weren't connecting properly with history, she designed a range of dolls that wore period costumes and came with books explaining their place in the nation's history. Her "American Girl" doll company became so successful that in 1998 she sold it to the Mattel toy empire for $US700 million. Revisiting her college as a successful alumnus, she lamented how Aurora, like many small towns in this region, was in shocking decline. Once-grand properties – including the old Morgan mansion, the prep school, Aurora Inn, the bar, the old post office and a string of commercial properties – had been gifted to the college and were languishing in various states of disrepair. In 2001 Rowland offered to restore them as luxury retreats and high-end outlets; she'd gift the money and the college would only have to administer them and ensure they covered their running costs. Rowland, who possessed a formidable collection of art and antiques as well as a prodigious sense of design, got to work with an army of builders. The street was landscaped, power lines buried. No detail was judged too small – or too large. When Rowland didn't like the way an ancient oak obscured the lake view from the new restaurant at the back of the Aurora Inn, the oak was dug up and moved four metres to the right. She was also enamoured with a local design house called MacKenzie-Childs, operating out of a vast property of farm and barns three kilometres from Aurora. It produced highly distinctive furniture and ceramics through a collective of workers. She bought that, too. The Inns, the college and the McKenzie-Childs design house would be three legs supporting the new Aurora. By 2008 she'd spent $40 million in a town of just 800 people (today that figure is said to be $80m). But it didn't stop an acerbic bumper sticker from appearing on the pick-up trucks of local farmers and the SUVs of families who'd been in the town for decades: "Aurora Was Pleasant Before." Wallcourt Hall was built as a prep school in 1909. "People got pissed because she closed their dives down!" said a local who wanted to remain anonymous. "Fargo was a dive bar, y'know? You'd put 10 bucks on the bar and drink all night. But even if it was a dive, what the hell, man – it was their dive!" A local artist believes Rowland wasn't consultative enough and just drove her vision through. "You should have seen the Main Street when they were working on the Inn! You couldn't move. But money talks in America, and how are you going to argue with a billionaire?" A third, however is pragmatic on the change: "Aurora was going nowhere. Pleasant has changed all that. She's brought tourism into the town and given people jobs." Well, Pleasant Rowland now owns the heart of Aurora. 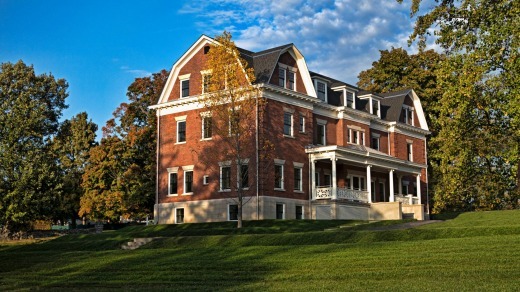 By 2013, it was clear Wells College was better at being a college than a commercial manager, so she bought the portfolio of 10 properties for $US6 million. 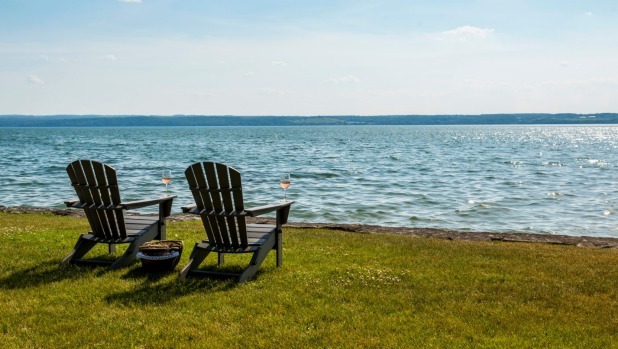 Today, some 200 people are employed in the running of the operations; there's also a new marketing arm for the Inns, and the influential American travel press are waking up to what's on offer on the shores of Cayuga Lake. The week I'm there, Country Living calls Aurora America's best kept secret. Next year will probably see the old Shakleton Funeral Home – another monumental pile in white weatherboard – get a many-million-dollar makeover to become the fifth retreat. Personally, I've never encountered anything like Aurora, though I do understand the dynamics of country towns because I live in one. And I know exactly how I'd feel if someone breezed in with a big-assed cheque book to start rebuilding the place I call home. But I really enjoy my two days in Aurora. I meet warm, genuine and exceptionally open people (not least those who work for Rowland). I see properties like the EB Morgan House that are easily worth double the tariff. And I explore the town as well as a flourishing local industry of artisan producers and wine growers. So here's the twist. Like anyone who stops for a day or two in the refashioned community of Aurora, I'm voting with my feet on the transformation. And my disapproval of billionaires making a town as cute as a doll's house is a moot point – because I guess I've become part of the story. You have to keep pinching yourself while touring the three-storey 1870s farmhouse on the MacKenzie-Childs estate. Every inch has been decorated with the designs of Richard and Victoria MacKenzie-Childs, a couple who seemed to be playing out their own Mad Hatter's tea party, with every surface adorned with hearts and dots and (patented) "courtly checkers". Every painted fixture and furnishing is produced (and available) in whopping studios built into the farm's giant barns. Adding to the strangeness is the hagiographic commentary on the couple, suggesting their genius was evolved in the 1870s. In fact the MacKenzie-Childs sold out to Pleasant Rowland after bankruptcy in 2001, and now work under the brand "Richard and Victoria". A few kilometres up the road, Sherwood shows you what happens to giant timber houses when they're not loved. They fall over. Don't miss the Howland Stone Store on the crossroads manned by Quaker volunteers. Upstairs is a bizarre collection of ephemera collected by a late 19th-century traveller. 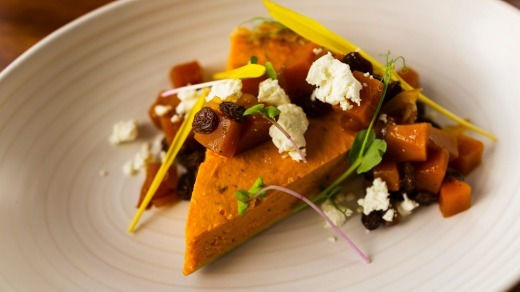 European fine dining and the American love of mega-portions makes for a tricky fusion but chef Patrick Higgins manages it with style. His pork belly with cherry chutney is blissful; the grilled tenderloin with blue-cheese-whipped potato is hard to go past. 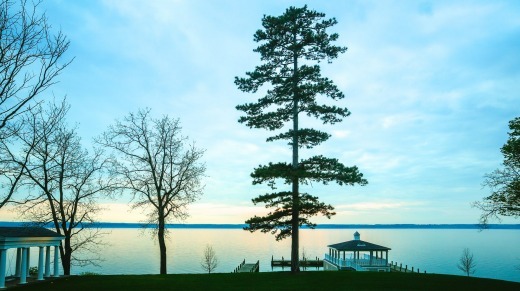 In summer the terrace is open for sunset tables with views down onto the lake – and the improbably transplanted oak. 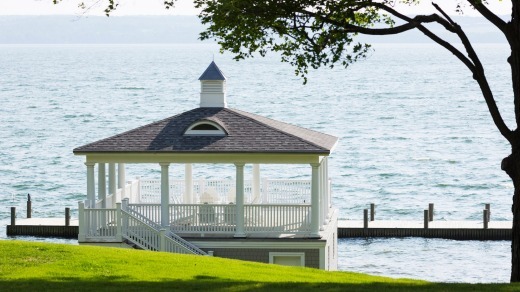 Cayuga Lake is part of the Finger Lakes cool-climate wine region. Heart and Hands Winery is next door to Aurora – a family operation finding success with what winemaker Tom Higgins calls the "heartbreak grape", pinot noir. The cellar door offers good cheer, good wine and a nice introduction to a region that's becoming a favourite among New York's wine cognoscenti. Qantas (qantas.com) flies from Melbourne and Sydney to New York via LA and Dallas. Aurora is a four-hour drive from La Guardia airport. Rooms in the four Inns start at $US150 in winter (from $US200 in summer); the tariff includes tea, coffee and morning muffins from the bakery.